Pair of round neoclassical style silver plate on copper trays with flanking medallions of urns with swags and border of scrolling acanthus leaves. Both have impressed marks on the underside for E. G. Webster of New York, circa 1900. One tray shows signs of more use that the other one, copper showing thru. 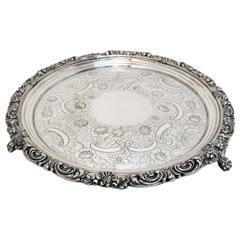 An early 19th century, silver on copper Sheffield footed salver, England, circa 1830. Antique English silver tray, Sheffield silver plated signed Barker Co., circa 1900.